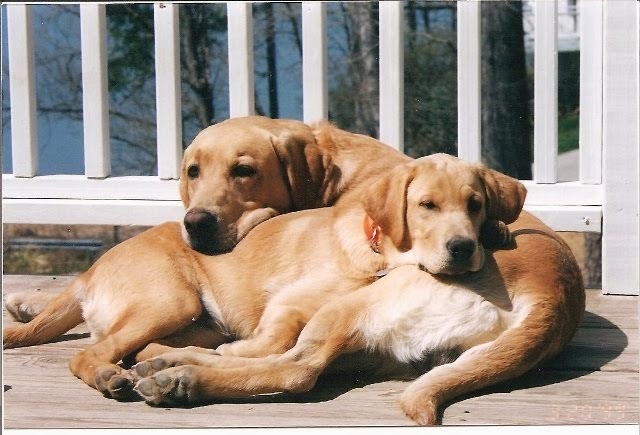 This is one of "the best dogs I have ever owned", That is what my husband said about our yellow lab from Hat Creek Farm. I wanted to surprise my husband for fathers day with a yellow lab. After recommendations from our vet as well as others, I contacted Ms O'Connor. I told her exactly what we were looking for in a dog and she listened b/c she truly gave us the perfect dog. At first I was uncomfortable at not being able to come pick my own dog out of the litter but I must say that Ms O'Connor knew exactly what we wanted b/c I could not have come and made a better pick myself. I would trust her completely with not only picking a dog for me but the overall health of the puppy when you get it as well as the wonderful temperament of the dog. I have seen her home and where these dogs begin thier lives. It is clean, the dogs are well taken care of and loved and have plenty of room to run and play. You can tell our dog was not only "taken care" of as a new puppy but also truly loved b/c of the way she loved us from the first day we got her. We continue to be impressed with our dog's intelligence and affection for us. I would recommend Jean O'Connor and Hat Creek Farm to anyone, anywhere!